RapiClear® is a water-soluble clearing reagent for enhanced visualization of both fluorescence and non-fluorescence labeled biological specimens. It can be applied in viewing cell morphology in tissues of mammals, plants, insects, and even the biomaterial scaffold such as collage, chitosan, and cellulose. Targets that are usually indistinguishable or blurry due to specimen opacity can now be clearly visualized simply by applying RapiClear® in the mounting procedure. RapiClear® CS is an aqueous-based clearing reagent with the same refractive index as the CLARITYTM (Stanford University) hydrogel–tissue hybrid (1.45nD). Lipid-extracted hydrogel effectively becomes uniformly transparent after immersion in RapiClear® CS mounting solution. As a result, sample image quality can reach to cellular resolution even at the depth of several millimeters using confocal microscopy or light sheet illumination microscopy. iSpacers are made from different thickness adhesive tape. By simply pressing a spacer to a microscope slide or coverslip, a sealed watertight well is formed to contain RapiClear® in place and prevents evaporation. The wells steady and support thick and free-floating specimens allowing resolution of internal fine structure without compression. The specimen and spacer can be sandwiched between two coverslips. Meanwhile, iSpacers can be stacked to different depth desired for direct use with light, fluorescence, or confocal microscopy. For more information on these featured products from SunJin Lab Co., click here. 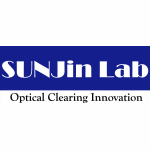 For more information on featured products from SunJin Lab Co., click here.